Michaela graduated from the University of Northern Colorado in 1996 with a Master’s degree as an Advanced Nurse Practitioner. 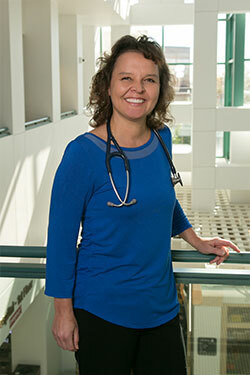 In May of 2012, Michaela Romero earned her doctoral degree from the University of Northern Colorado as a clinical advanced nurse practitioner. Dr. Romero is Board Certified in Family Medicine. Michaela has 6 years experience working in the Emergency Dept. of St. Anthony’s Hospital and 15 years experience as a Family Nurse Practitioner. For the past 8 years, Michaela has also been concurrently working in clinical research. She joined Flatiron Internal Medicine in 2009. Michaela is proactive; working with her patients in a collaborative partnership. She emphasizes health maintenance and illness prevention. Patients with existing medical conditions can look forward to optimizing their quality of life by working together with Michaela. Patients can expect Michaela to provide detailed comprehensive care to them in a personal manner. In her spare time, Michaela enjoys martial arts (she holds a 3rd degree black belt), yoga, whitewater rafting, and time with her husband and grandchildren.